Nerveline Jude came to the United States a little over a decade ago. She left the island of Dominica in 2006, hoping to escape a legal system that often imprisons and institutionalizes LGBTQ people. It took some time for Jude to find her voice. After moving to New York City, she said she struggled to feel settled at first; tasks like finding housing, health care and a job seemed daunting. Then a friend connected her with an immigrant support group that met once a week at the Lesbian, Gay, Bisexual and Transgender Community Center (also referred to simply as "The Center") in Manhattan. Eleven years later, Jude now serves as a facilitator for the The Center's Immigrant Leadership and Empowerment Group, helping mentor other LGBTQ immigrants looking for a space to feel heard. Cristina Herrera, coordinator for transgender and gender-nonconforming services at The Center, said Jude’s story reflects the importance of peer-to-peer support and community-building for LGBTQ immigrants in the U.S. For many, these networks of support are one of the few safe spaces they can turn to for help or advice — especially amid an increase in anti-immigrant rhetoric. A combination of factors has generated skepticism and distrust among immigrant communities toward the current presidential administration, according to Herrera. Those factors include U.S. Immigration and Customs Enforcement (ICE) officers arresting people in places like hospitals, schools and courthouses, which may have the effect of intimidating immigrants into foregoing the most essential aspects of community participation. 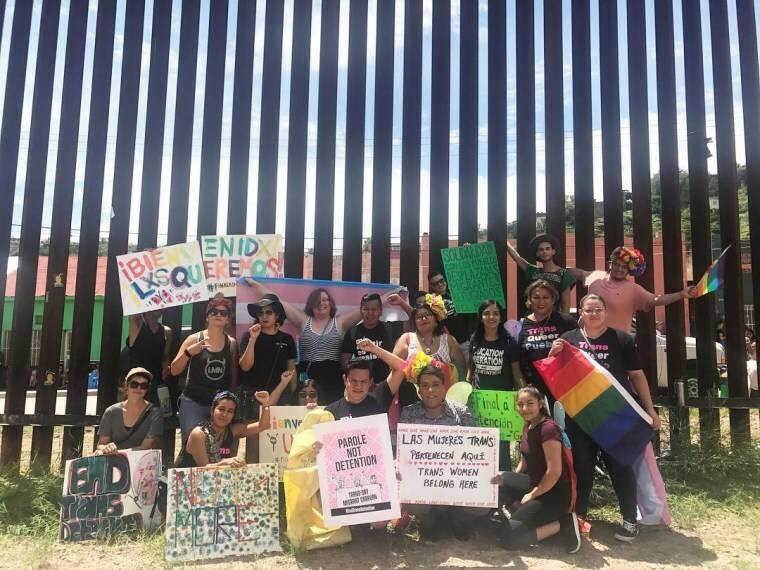 For LGBTQ immigrants, the weight of anti-immigrant rhetoric and actions are often compounded by their sexual or gender identity. As the Trump administration nominates officials with anti-LGBTQ track records and challenges the community’s civil rights protections, many lesbian, gay, bisexual, transgender and queer immigrants feel these actions mirror the same oppression they faced in their home countries. While city and state laws can soften how federal immigration standards are enforced, the fact that some LGBTQ immigrants don’t have that buffer creates disparities in safety, quality of life and access to legal counsel around the country. This “bubble effect” is why Herrera and others are eager to expand local tactics into models for community-building among vulnerable immigrant populations across the U.S. — and outside of it. That wait becomes less burdensome when new arrivals have a place to land and find support, she added, but many LGBTQ immigrants aren’t offered that opportunity. Those held at detention facilities often face exposure to sexual violence, solitary confinement and substandard health care. On average, only 14 percent of immigrants in detention are able to obtain legal counsel. So what happens when networks of support have to overcome physical barriers? Gutierrez is a trans woman from Mexico, and her work often focuses on LGBTQ immigrants making the journey to the U.S. or being detained at the border. She said connecting detained people to nationwide networks of support means battling a system that seeks to render them invisible. Gutierrez stressed that the most successful modes of community-building should create solidarity without erasing difference. She said that starts by fostering LGBTQ communities willing to center more than cisgender, male perspectives and reject mainstream moralizing over immigrant narratives. Thousands of miles away at The Center in New York, Nerveline Jude echoed a similar sentiment. Even in the "bubble" of a liberal city, she said having the courage to be visible and trust in others can feel like a daunting first step for queer people arriving in the U.S. There is still uncertainty over what the future holds for many immigrants in the U.S., particularly undocumented individuals and DACA recipients. But amid this uncertainty, Jude, Herrera and Gutierrez are committed to making sure LGBTQ people across the country can find each other and provide support networks.